Lucy Martin, Valley Oak with Oak Galls and Lichen, Quercus lobata; Oak galls generated by wasps of the Cynipidae family; Teloschistes chrysophthalmus, Evernia prunastri, Usnea sp., Xanthoria parietina, Flavopunctelia flaventior, Flavoparmelia caperata, gouache on paper, 23 x 17 inches. Courtesy of the artist. Image via Wave Hill. Wave Hill, in partnership with the American Society of Botanical Artists, are collaboratively celebrating the tradition and contemporary practice of botanical art with the 21st Annual International exhibition ~ and what a beautiful time of year to visit Wave Hill. 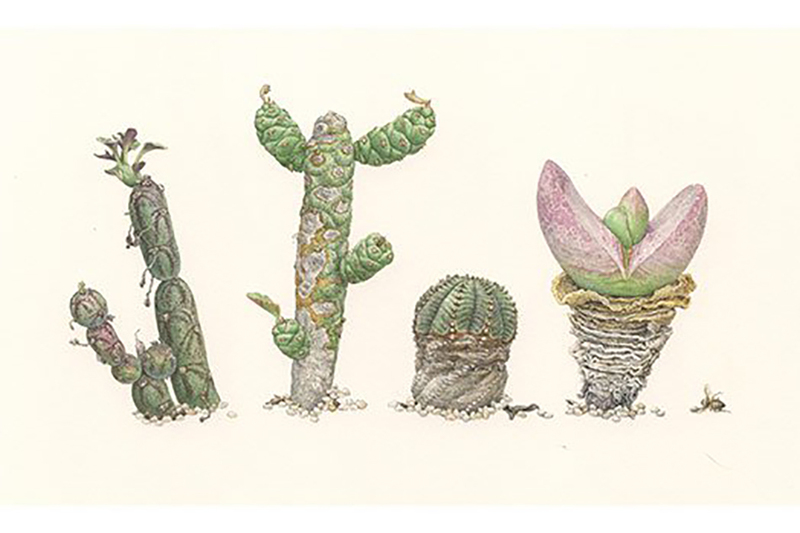 Asuka Hishiki, Wave Hill Little Gangsters, Senecio articulatus, Monadenium lugardae, Euphorbia obesa, Glottiphyllum nelii, 2018, watercolor on paper, 7 1/2 x 12 1/4 inches. Courtesy of the artist. Image via Wave Hill. The exhibition includes botanical artworks by 47 international artists from the United States, Australia, Canada, France, Japan, Russia, Slovenia and the UK are presented. 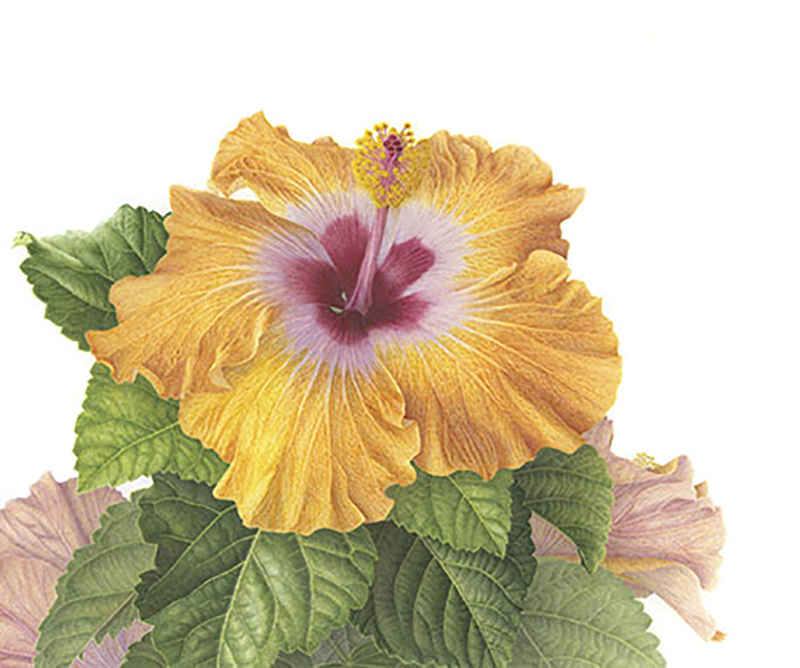 The artists’ renderings of exotic and native flowers, fruits, roots, and trees provide unique points of view with precise attention to detail that astonish and provoke close observation. A number of pieces that highlight specimens found at Wave Hill can be seen in the north gallery. Interpretations of exotic plants continue in the middle gallery, and the south gallery underscores the passage of time associated with autumnal colors and deterioration. Mitsuko Schultz, Hibiscus, Hibiscus rosa-sinensis, 2018, watercolor on paper, 13 ½ x 15 1/5 inches. Courtesy of the artist. Image via Wave Hill. 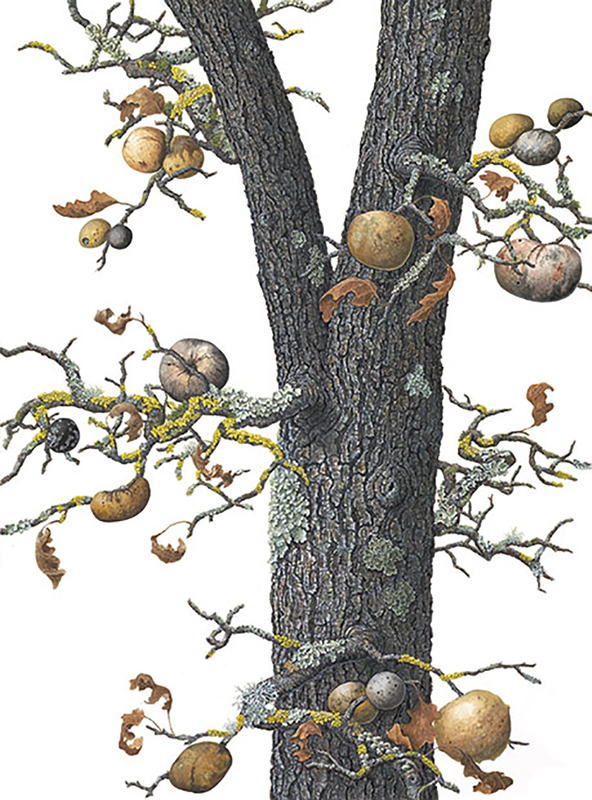 The 21st Annual International ‘American Society of Botanical Artists’ will be on view at Wave Hill through December 2, 2018 in the Glyndor Gallery. Jurors for this exhibition were Ken Druse, garden lecturer, author, and photographer; Karen Kluglein, botanical artist; and Eileen Jeng Lynch, Curator of Visual Arts, Wave Hill. Wave Hill is located at 675 W 252nd Street, Bronx, NY. An illustrated catalogue that includes all of the works, as well as an essay by Ken Druse, is available in The Shop. The artworks in the exhibition are also available through The Shop.